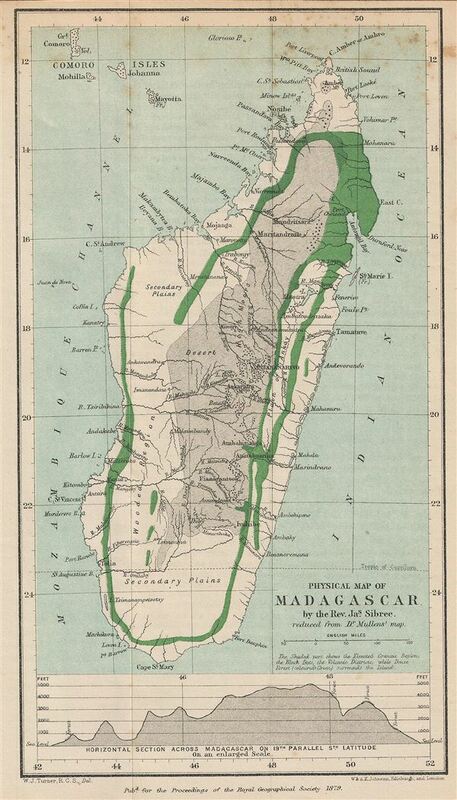 This is a fine example of the 1879 Stanford physical map of Madagascar. Stanford's map covers the entire island country from Cape Amber to Cape St. Mary. It includes the Comoros Islands of Great Comoro (Grande Comore or Ngazidja), Mohila (Moheli or Mwali), Johanna (Anjouan or Nzwani) and Mayotta (Mayotte). At the base of the map a horizontal cross-section reveals Madagascar's elevations. Various towns, cities, rivers, volcanic districts, forests and other topographical details are also noted. This map was drawn by A. K. Johnston and published by e. Stanford with contributions from Rev. James Sibree, as part of the Proceedings of the Royal Geographical Society and Monthly Record of Geography, Vol. I, in 1879.